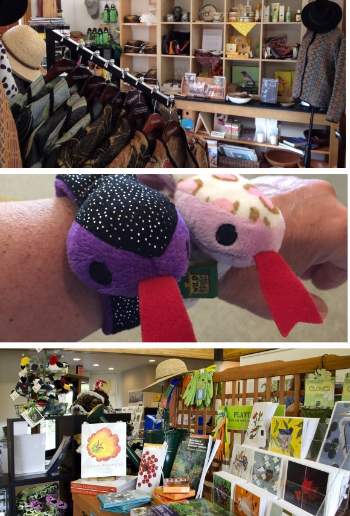 Explore the Arboretum Gift Shop to find great gifts for gardeners, nature enthusiasts, children, and yourself! Located in the Visitor’s Center lobby, the shop recently underwent a transformation to offer a new look and new amenities. Café tables that overlook the meadow provide a welcoming spot for relaxing while children engage in preschool or homeschool programs. Coffee service and Wi-Fi are also offered. Stop by to browse the latest selection of jewelry, clothing, logo items, books, and nature-inspired gifts for all ages. * Eartha Handmade Tile - beautiful and brightly glazed terra cotta tile created by hand from an original design sculpted by Maryland artist Parran Collery. All of her work is inspired by nature. * Adkins Arboretum tea towels, designed by artist Barbara Bryan and inspired by all things Adkins Arboretum! * Fairy garden components, including cottages, wildlife, and fairies. These make a perfect companion to a hypertufa pot. * Bijou handcrafted organic goat milk soaps made locally by Brook Schumann. Scents include Crow Farm Red Wine, orange calendula, calico fields lavender, and mint. * Warblers of North America, a new guide from Quick Reference Publishing. Includes easy field ID and distinguishing features for easy recognition. The Bookstore boasts a broad selection of books endorsed by the Arboretum Book Club. If you have already read Silent Spring by Rachel Carson or Sand County Almanac by Aldo Leopold, perhaps The Wild Trees by Richard Preston will go home in your bag. The Bookstore's shelves are filled with both hard- and softcover writings that are informative, imaginative, and memorable. 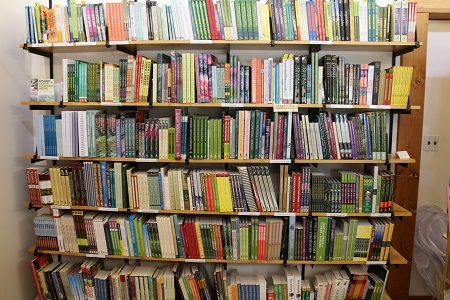 And the Arboretum's list of Recommended Books for Gardeners makes shopping easy. New in 2015 is Chesapeake Gardening & Landscaping: The Essential Green Guide by Barbara W. Ellis, published by University of North Carolina press in association with Adkins Arboretum. Order your copy today! If you're unable to decide on a gift for that special someone, a gift membership fits all sizes! Arboretum memberships are available for both individuals and households and come with many perks - not the least of which is a great reason to return for another visit. Arboretum members receive a 10% discount on items purchased in the Gift Shop and Bookstore.